Century Cycles Blog: Clean Bottle: No more moldy bottles! Clean Bottle: No more moldy bottles! You couldn't help but see the Clean Bottle TV commercials during the Tour de France last summer. Now check out Clean Bottles for yourself at all three Century Cycles! 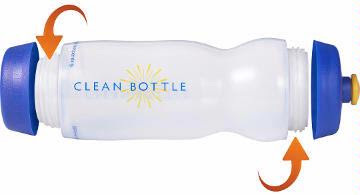 Clean Bottle™ ($9.99) is a water bottle with a patent-pending, leak-proof, screw-off bottom. Gone are the days of stinky, moldy water bottles (and of trying in vain to wash out that funk at the bottom). Clean Bottle is made with 100% non-toxic, BPA-free plastics, making it safe to use over and over. It is also top-rack dishwasher safe, so you can run it in the dishwasher without fear of it breaking down, plus 10% of all the Clean Bottle company's profits are donated to eco and cycling friendly charities that you vote for. What are YOU thankful for as a cyclist? FOX 8 Hot List: Time to vote! 1800 miles in New Zealand with "Wonder Woman"
Encore tonight of "Race Across the Sky"
Sebastian Bach rocks a Raleigh!